This is the one I made from scratch for a friend's party last Saturday night. We had the left overs for Breakfast the next morning. Yum! 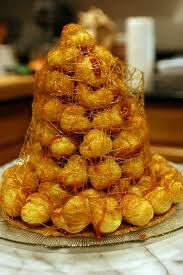 The Croquembouche' desert has been made in France since the 17th century. It was made for weddings, Christmas and other special events. It is said that it was invented in 1788 by a French Chief,Antoine Creme' It is from a family of deserts known as. "pieces montees," or mounted pieces.This is a form of desert that is constructed from several components and designed to look festive. A cone shape is the usual shape desired and this is perfect for Christmas, as it resembles the Christmas Tree, They are often so beautiful, that people hesitate to eat them.The word ,"croquembouche'," roughly means ,"crack in your mouth." A croquembouche' is a cone of cream puffs, filled with pastry cream, and coated with spun sugar caramel,made to look like a spider web.This is a very traditional wedding cake and is also popular at Christmas. This desert is more well known in it's native France, but does appear on some American tables. The French brought the receipt to New Orleans and it has traveled all over America, Very popular with pastry chefs in fine hotels and the White House. The Croquembouche' has been a long time favorite of mine. The first time I saw this desert was in New Orleans. I happened to be there at Christmas, and took a tour of the Herman Grimma House Museum, where 4 of these deserts were displayed on the dining room table. I have been making them at Christmas ever since. The cream puffs will hold up for days and if not eaten for months. The sugar makes a semi hard crust on the puffs. When you bite into one, the first taste you get is the caramel , then the pastry and finally the reach soft cream. They are a delight. They are a little trouble to make, but well worth it, when you see people's face as they view them for the first time, and finally when they taste them. I hope someday you will try and make one for your next party or event. If you don't feel inclined to do so, you can always order one from your favorite bakery. I have also in a pinch, bought the ready made cream puffs, frozen from Sam's Club, assembled them ,and no one knew the difference.That is, unless you tell! I hope you all are getting ready for Christmas, with the tree up, baking done and family arriving. Please stop by any time for a read and a tour at, My Old Historic House. I will always leave the lights on and Sissy Dog will meet you with a jump and a kiss and we will have some Croquembouche' for you to taste. And if you want to make your own, I am closing with the receipt.Have fun and enjoy! This one I made for the table at, My Old Historic House. I confess, I did not add the pastry cream as I wanted this one to last all month on display. 1 1/4 cups whole milk. In a small pan warm the milk over low heat until is is just hot enough to steam. While the milk is warming, whisk together egg yokes, sugar, flour and corn starch until mixture is smooth. Once the milk is steaming add 1/2 of it, whisking constantly to the egg mixture. Add the milk and eggs back into the milk, continue stirring for 1-2 minutes or until the custard reaches 170 or is very thick. Remove from heat, stir in the vanilla and chill the cream before filling , about 2 hours. In a medium saucepan, melt butter in the water , add salt and stir until a thick batter is formed, beat in the eggs , one at a time, until the butter is smooth. Preheat oven to 400 and grease 2 baking sheets. Spoon the prepared dough into 24 small rounds on each sheet, Bake for 30 -35 minutes until they puff up and are golden brown.Remove from the oven and allow to cool on a wire rack for 20 minutes before you fill them. Place the pastry cream into a pastry bag and and fill each puff with about 1 tablespoon of cream. Put sugar into a medium sauce pan and pour water over it. Once the mixture is up to a simmer, wipe down the sides of the pan with a pastry brush. Boil; the sugar for 15-20 minutes -until it turns pale golden brown. Do not let it burn .Remove pan from heat and put pan in ice water for about 5 seconds to stop the cooking process. After the sugar cools for 5 or 10 minutes, should have the consistency of maple sugar, you need to work fast. Dip each puff ,one at a time, into the melted sugar and arrangement to make your bush. Do one whole layer at a time.After all the puffs are assembled, lightly drizzle the remaining sugar, over the bush ,to forma cobweb of sugar. This makes about 48 medium sized servings. If this is your first try at making this, I would suggest you have a friend to help with the dipping and stacking, as the sugar can cool fast. To make a bigger bush, I would do it one batch at a time, especially the sugar assembly. Good luck, have fun, enjoy! They are so good. If you want to use the ready made and filled cream puffs, just do the sugar part and you'll be home free. I expect pictures. Merry Christmas. At the party this past weekend.